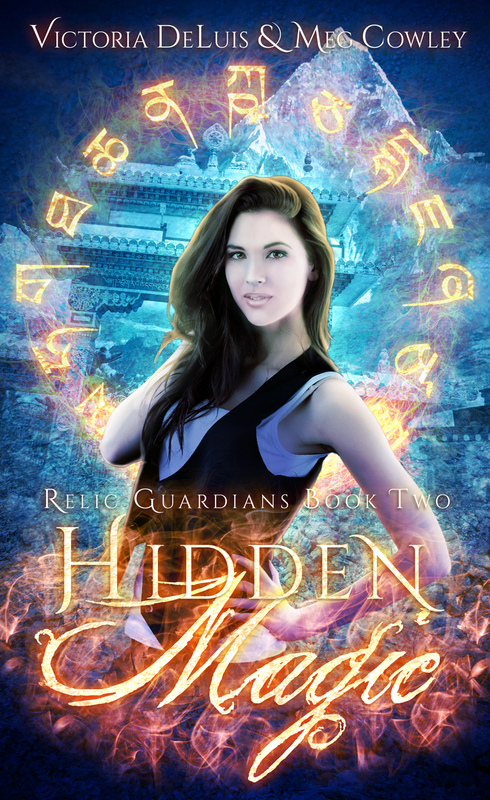 Hidden Magic the second book in the Relic Guardians series co-written with Meg Cowley is now available! One stone. One Wish. One life changing event. I’m Hayley Bevan, a museum curator, and my secondment to New York is about to get a whole lot more interesting. I couldn’t wait to pore over ancient Buddhist discoveries, but there was one that I hadn’t expected to see. Little did I know, I’d find more than I bargained for; a stone that was nothing more than a myth… or so we all thought. With a wish-fulfilling stone in my grasp and a murderous investor desperate to get his hands on it, I’m thrust into a world I never knew existed. Now I have a weapon that can destroy worlds, and no idea how to keep it safe in a world where I’m drowned by magic I don’t understand and can’t control. How do I find my place? How far will my journey take me? More importantly, who can I trust to guide me? I gripped the door handle as the cabbie tore around the corner and joined the thundering traffic on Grand Central Parkway. Blankets of dark cloud released a torrential load that pounded on the roof of the taxi and obscured my view through the window. If I wiped away the condensation from my breath on the glass and squinted through the droplets, I could just make out the strobe lights of aircraft overhead. “How much longer?” I asked the driver. “Twenty minutes, if we’re lucky.” He smiled at me in the mirror before returning his attention to the road. I looked at my phone. Twenty past five. Great. This day had barely started, but it kept getting better and better. First, no wake-up call, and then no pickup. Instead of experiencing the comfort of the museum’s Audi A4, I sat on a spongy seat, pinned by a seat belt that kept tightening itself around my chest, and endured the lingering stench of sweat, Thai food, and banana air freshener. Stress tightened my chest. I fought the urge to nibble my fingers and glanced at the time again. Damn it! I smoothed the creases out of my forehead, took a deep breath and dialled Ben’s number for the umpteenth time. After an eternity, the rain eased and we left the densely-populated area of Queens, only to be greeted by the immense expanse of JFK. “Which cargo area did you say again?” the cabbie asked. “Area A.” I pulled the paperwork from my satchel to check the details. “Hanger 19b.” I delved in deeper and emerged a few seconds later with my temporary ID from the New York Museum of Life and Antiquities, along with my ID for the British Archaeological Museum, which enabled us to pass through the security checkpoint with the minimal of fuss. Now that we had arrived, I was practically jumping out of my seat to see the cargo. I’d only just heard of the Kailash exhibition in Tibet — no surprise, it was kept under tight wraps given the sacred beliefs surrounding the site — but it was being heralded as a complete success; at least within the confines of the museum. My job was to catalogue the finds and manage their future preservation. Hangar 19b stood secluded at the end of a quiet road. As soon as the car came to a stop, I thanked the cabbie, paid the fare, and scrambled outside. The smell of jet fuel mingled with the oil-slick stench of water from the surrounding Bergen Basin hit me like a wall. The cabbie looked at me as though I was from another planet. Although, being a British woman in New York, that might not have been far from the truth. “I’ll stick around for a bit, make sure you get in safely,” he said after a moment. I nodded my thanks, then proceeded towards the building. The gate was open, so I slipped inside, moving through the vast, empty courtyard and scanning the area for any sign of movement. The sound of aircraft overwhelmed any other noises, and the eerie darkness of the night was only punctuated by the glare from the taxi headlight reflecting on the rain-kissed tarmac. I pulled my jacket tighter around me, but was unable to block out the cold air and the incessant thought that somebody would jump out and shoot me at any moment. Now that the rain had stopped, I looked to the sky and wondered if the clouds would part and let the stars shine. Given the light pollution over New York, I doubted if the stars ever shone on the city. I sighed, frustrated with man’s obtrusive impact on nature, but then I realised part of the sky-glow was emanating from the far side of the hangar. Somewhat reassured, I glanced over my shoulder and waved to the cabbie, then edged around the immense metal structure to the main doors. As soon as I did, my viewpoint on the world changed. I was definitely in the right place. I hope you enjoyed this brief excerpt 🙂 If so, you can check out the whole series on it’s AMAZON page.